When the time comes to decorate, we all know the daunting feeling we get when we see that blank canvas. Deciding on the right colour scheme for your room can be as important as choosing the right furniture. Colour stimulates the mind as well as our emotions. There is a wealth of information on the internet about the symbolism and history behind the use of certain colours. But we're going to keep things simple and guide you in the direction of interior colour schemes. Take a look at our guide to help make that perfect colour choice! 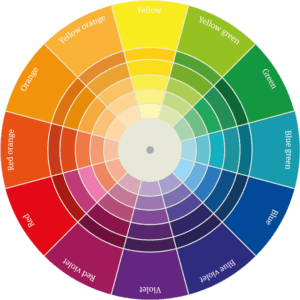 The Colour Wheel - Your best friend when it comes to selecting interior paints. Cool colours are on the right-hand side of our colour wheel. They are hues ranging from Green to Blue, through Blue-Violet. These colours are best used when you want to create a calming and relaxing atmosphere. Cool colours are typically used in the living rooms and bedrooms, as they promote a sense of tranquillity and relaxation. Blue is a particular interior favourite for creating calmness, peace and tranquillity. It is a popular colour for many rooms due to the fact it can go with both traditional and modern styles. The Grey Gloss Fern Console and White Trestle Desk work great against this dark blue wall to create a modern vintage vibe. 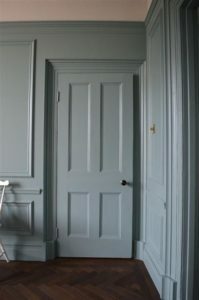 Try Oval Room Blue from Farrow and Ball for a rich shade to suit your vintage interior. Contemporary styles can be created using a cooler tone of blue with mismatched metallics and gloss finishes. Or try creating a more colourful interior by pairing shades of blue work well with pastel colours. Think soft apple greens or bright yellows for a great combination creating a sunny Mediterranean style. 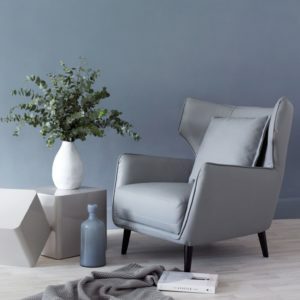 Denim Drift from Dulux is the perfect cool shade for modern interiors. Green is the colour used to symbolize nature, balance, harmony and positivity. 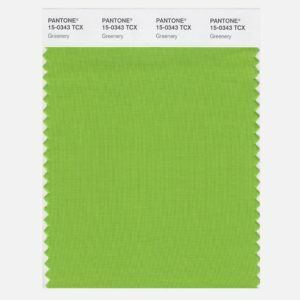 Pantone announced Greenery as its Colour of the Year 2017 due to its fresh, zesty feel. It creates a relaxing atmosphere when used in various tones. 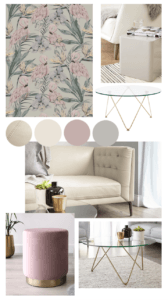 Team with pastels and neutrals to create a contemporary look in a living room. Alternatively, for a country cottage look, work with shades of cream and neutrals for a look that's very easy on the eyes. The Arc and Riva Set brings just the right amount of colour to your kitchen. Use a graphic rug for a modern look. Adding black and white to green can create an Art Deco look or why not be bold and try a retro theme with lime green for something a little different. Purple can be a tricky colour to introduce into our homes. Pale Lilac can feel very young and sweet, but too dark can feel a bit seedy. The key to getting this trend right is using purple sparingly and combining with other colours. 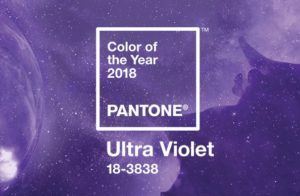 When Pantone announced UltraViolet as 2018's Colour of the Year, we were all a little unsure what to think. 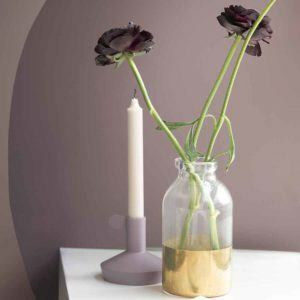 However, after reviewing the colour combinations suggested by Pantone, we came round to using purple in our homes. Keep your walls neutral and play with purple in your furniture and soft furnishings. 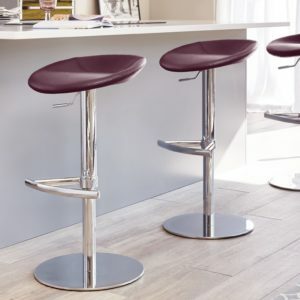 The Anzio Barstool is just the right amount of attitude and colour for modern kitchens. Keep accessories metallic for a cool vibe and for a lighter feeling home. Warm colours are on the left -hand side of our colour wheel. These are your reds, oranges, pinks and yellows. They are lively, stimulating and domineer over cool colours. Warm colours should not be used as a base colour and are best used when highlighting statement pieces in your room. Just like warning signs, red is a colour which grabs your attention. 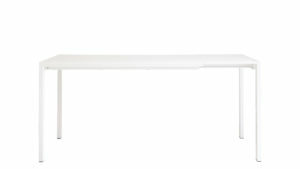 Making it ideal when used on a feature wall or creating a statement piece in a room. As red is a very dominating, powerful colour, it's best to use in the social rooms in your house, such as your kitchen or playroom. 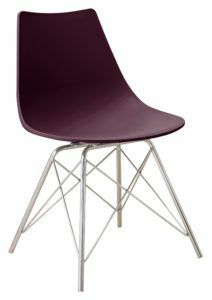 The Brick Red Finn Dining Chair is the perfect way to introduce red into your home without it feeling too overpowering. Avoid using red in your bedroom or living room, as it is a very visually stimulating colour and will not help with the relaxation. That said, when used in small doses, red can often be more effective, so great for those decorative accessories. 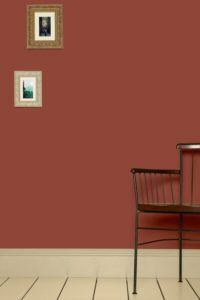 For a more subtle red, take a look at Picture Callery Red, from Farrow and Ball for a more traditional and softer look. Pair with off-white and dark woods to create an antique vibe. Like the sunshine, yellow is bright and exudes excitement so ideal for a child's room or in an entrance hallway. It is also effective when used to highlight elements of your space. When choosing yellow furniture, be sure the rest of the decor is subtle, otherwise, you risk creating a very busy looking room. Navy and Yellow are a match made in heaven, so stick to dark blue walls and offset with a pop of mustard. As a mixture of red and yellow, it shares both attributes of these colours. Although Orange is hot and fiery like Red, it is not as aggressive. Orange actually stimulates mental activity, so add a splash of orange in a study or children's playroom. It also works well in a kitchen as is associated with appetite and health foods. Pink has been having a moment recently. Be in Millenial pink or Plaster pinks, we see different shades popping up all over the interior circuit. Blush pink has been a favourite in our homes for a while now, especially when paired with copper and white. 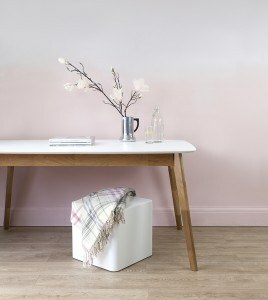 Create a real statement by painting a pink ombre wall. This is a great interior paint effect for a little girls room or a home office. tone down pink by mixing with Grey and White for a more grown-up look. Neutrals are great for creating a light and soft environment and giving the illusion of space. This scheme looks stylish, sophisticated and is great used as a blank canvas. You can then injected with colour, print and pattern for interest. This is ideal as a base colour as allows you to update the room by just using bright accents and accessories. These tones are great when used with warm tones such as rich red, mushroom, and terracotta. Black is formal, elegant and prestigious. It makes other colours stand out so ideal for teaming up with warm shades. Too much black in a space can make the room feel smaller so stick to limiting the quantities by adding accents of other colours. Black is perfect for that formal dining area to add a touch of class and style. Perhaps try black Leather Dining Chairs as they are great at hiding marks and bring drama to your home. Our black chrome is a great alternative to a classic chrome finish, so go to the dark side and play with these inky tones. The experts at Dulux say; "Spiced Honey is a warm Amber tone, inspired by the beauty and versatility of honey itself. Spiced Honey can be soothing or calming, cosy or vibrant, depending on the palette you pair it with." 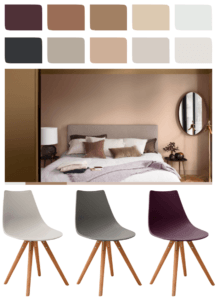 Dulux have created 4 very different looks incorporating Spiced Honey into all manner of interior styles. But how do you work this look into your home? With a new colour of the year from Dulux and Pantone released every Autumn / Winter, it's hard to keep up with these changing colour trends. 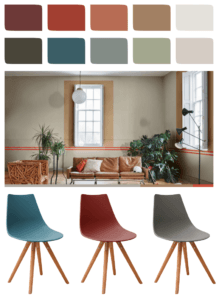 So to help you out, we've taken the new Dulux Spiced Honey colour palettes and shown you how you can change your dining chairs to sit within these interior schemes. This is a quick and cost effective way of updating your interiors. 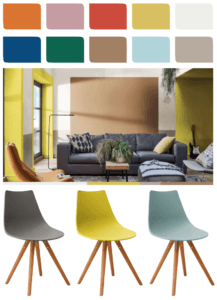 Use the new colour of the year 2019 on your walls, and mix and match our colourful dining chairs to suit your favourite style. This colour palette features very harmonious, natural, earthy tones. Spiced honey has been balanced out with darker mulberry and slate greys, and lighter oatmeal and taupe shades to keep the colours similar. A harmonious colour palette is made from selecting neighbouring colours on the colour wheel. A few shades darker, or lighter, will create a soothing interior, perfectly suited for living rooms and bedrooms. 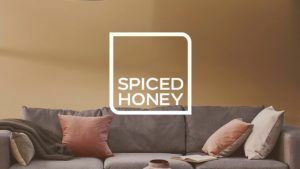 To introduce this colour palette of Spiced Honey into your home, keep your wall treatment simple, and match your woodwork and ceilings to your walls. 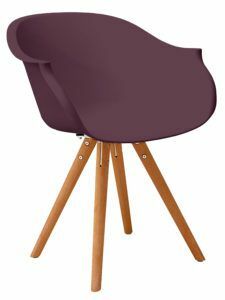 We've selected the Finn Dining chair in Taupe, Taupe Grey and Mulberry Purple to bring the light and dark shades to your Spiced Honey walls. Choose soft textures such as plush velvets and waffle knits to emphasise the soothing feel. 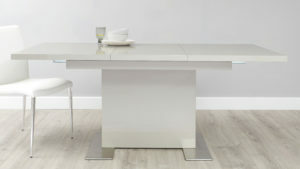 We recommend the Grey Gloss and Glass Arc Dining Table. 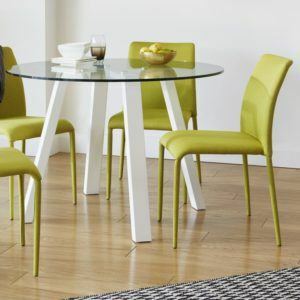 The high gloss grey leg complements the colour palette perfectly, while the glass top allows the colours of your Finn chairs to be seen at any angle. Similar to the Soothing colour palette, the Calming board has colours toned down with a grey base. Wack up the saturation of these pinks, purples, blues and greens, you will have a very eclectic look indeed. 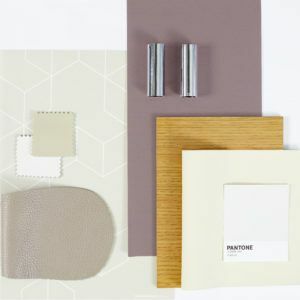 However, by choosing a more muted tone, we end up with the calming, pastel colour palette. 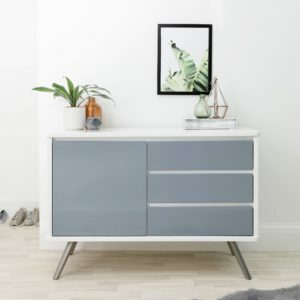 This Calming look is perfectly suited to rented accommodation or first-time buyers, as it works great with a blank canvas. 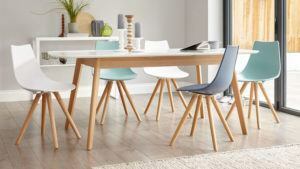 The Finn Chairs we've chosen with this board is the Aqua, Taupe and Steel Blue. 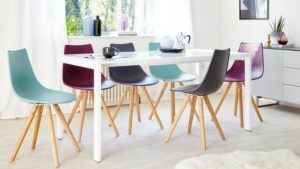 By keeping a cooler colour palette in our dining chairs, we can then inject Spiced Honey and the pink and purple tones into our wall colours and home accessories. 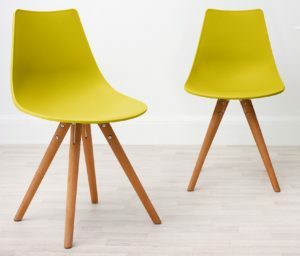 What's more, this combination of Finn chairs can be updated throughout the changing colour of the years. This palette will sit with Driftwood of 2018, and Denim Drift from back in 2017. 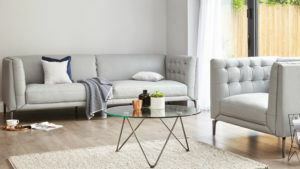 By sticking to a neutral colour palette, you give yourself the flexibility to refresh your soft furnishings and wall colours, rather than buying new colourful furniture every year! 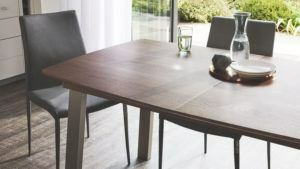 For this look, try the Aver Oak and White Extending Dining Table. 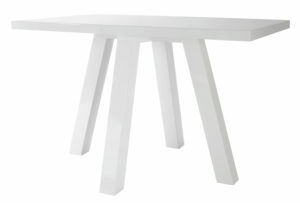 The matt white table top balanced with the oak legs bring warmth and a scandi vibe to your interiors. This Cosy colour palette is reminiscent of traditional English countryside cottages, with a slightly modern twist. The classic shades of sage, oatmeal and rust are brought into the 21st century with a pop of Brick Red and Teal. Dulux recommends being experimental with your wall paint treatment. The below image shows Spiced Honey used around windows with 2 stripes of brick red racing around the centre of the wall. 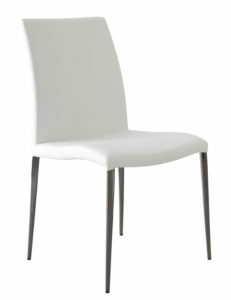 Stick to using the neutral colours on your walls for longevity, and inject a pop of colour into your dining chairs. 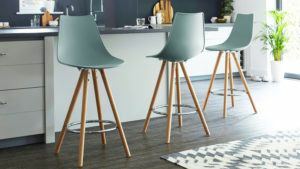 If this is the Spiced Honey look you're after, we suggest choosing the Finn Chairs in Teal, Brick Red and Taupe Grey. 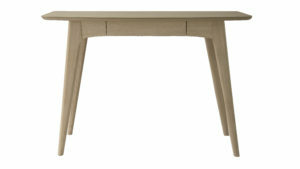 If you're looking for a new table too, we think the Cleo Dining Table would look great in the Calming setting. 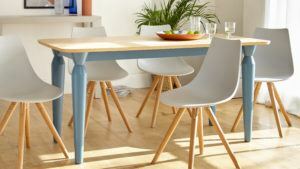 The Oak table top mimics the tone of Spiced Honey, whilst the powder blue base brings some much-needed colour. Finally, we have the Vibrant colour palette. 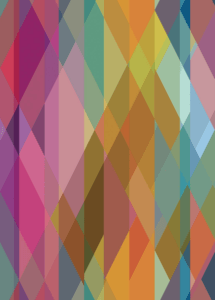 Made up of all the colours in the rainbow, however, knocked back to a slightly more muted shade. The key to getting this look right is to select one main colour and 2 accent shades. Introduce the remaining colours in small quantities throughout the space. We think as a starting point, the Slate Grey works perfectly with Spiced Honey. As an accent, Mustard and Aqua are always a safe bet. Then, the bright reds, oranges and royal blues can be used as your highlights in soft furnishings and accessories. 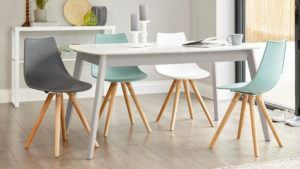 To avoid any danger of this look feeling too much like a playschool, be sure to choose a sleek and modern dining table. The Grey Gloss Sanza is a great option. Its angular silhouette will bring a crisp edge to the mismatch of colours, while the cool grey will balance those bright shades. How will you be using Spiced Honey in your home? Don't forget to share your beautiful homes with us by tagging #mydanetti on Facebook, Instagram and Twitter. We can't wait to see how you bring Spiced Honey into your homes. 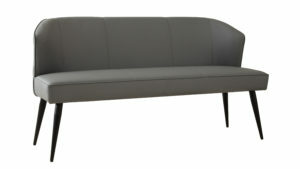 For the past few years, Grey has been the colour of choice for all of our interiors. However, we all know that trends come and go, and this year we are seeing a shift towards Neutrals. 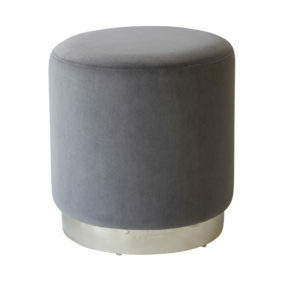 Grey still has a place in our homes, but now with undertones of taupes and creams. These earthy tones are richer, deeper and allow you to be more adventurous with your interior colour schemes. Take a look at our styling suggestions for each room in your home. From furniture to wallpaper to paint colours, you'll be updating your home with warm neutrals in no time at all. For most of us, the kitchen will probably be the most expensive purchase we make for our homes. Most of us won't be in the position to update it every time trends change! Which is why it's always wise to stick to a neutral colour pallet for those longer lasting purchases. Think stone coloured doors with wooden worktops... timeless! That said, there are a few small cost-effective home updates for your kitchen that you can update with the changing seasons. But let's start with the basics... Neutrals are great for the kitchen, as the majority of textures and materials which are used for kitchens sit very well in a neutral colour palette. Grey gloss and Oak is a perfect combination as the coolness of the grey is balanced by the warmness of the wood. 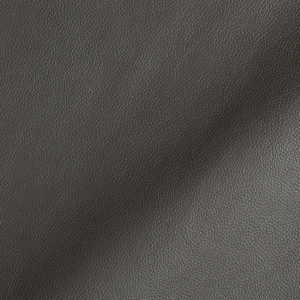 But be sure to choose a grey with an earthy tone, rather than a blue tone as this can look a bit too cool. 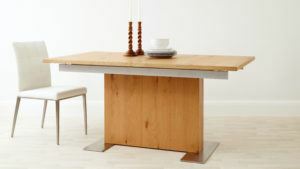 Our Cross Grey Gloss and Oak dining table is the perfect partner to your grey gloss kitchen. 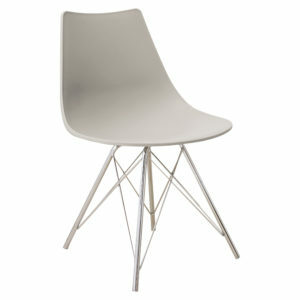 Pair with the Form Dining Chair in Cool Grey for a modern touch. Update your kitchen cupboard handles to chrome and play with marble textures to bring this look to life. It's these small details which will give your kitchen that interior designer edge. 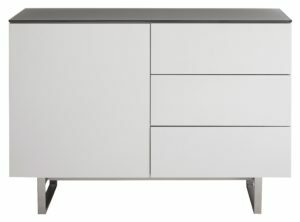 Stylists Tip: For extra kitchen storage, choose a simple grey gloss sideboard, such as our Lexi sideboard to keep the look clean and modern. Top it off with a cool wallpaper in an oatmeal shade to create a real focal point in your dining area. Our living rooms tend to be where we relax and unwind at the end of a long day. Because of this, calming colours are best suited to areas of relaxation as they exude that calming vibe. Pairing neutral shades with a blush pink and brushed brass creates an elegant and stylish interior. 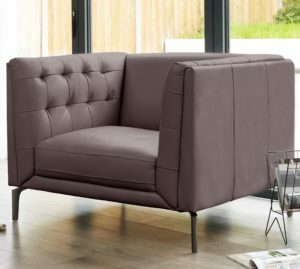 As with our kitchens, sofas are also an investment piece of furniture, so by choosing this is a neutral colour will ensure longevity. 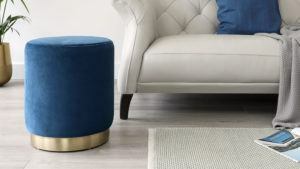 You can then update the more cost-effective items, such as side tables and coffee tables inline with current interior design trends. That way, your home is always bang on trend without breaking the bank! 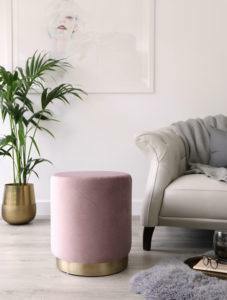 We think the warm Parchment real leather of our Ellis range sits perfectly with our new Plaza Velvet Stool in Blush. Pair with the Brass Ripple Coffee Table and a bold wallpaper for a feminine, neutral interior. Stylists Tip: If you want to great a more colourful look, but still in keeping with a neutral theme, try adding muted shades of green. The green and pink are a great colour combination, very on trend, but by selecting a more muted shade, the colour won't feel too overpowering. In turn, you've got a soothing neutral interior with a bit more depth and personality. For more masculine interiors, swap blush for navy blue. 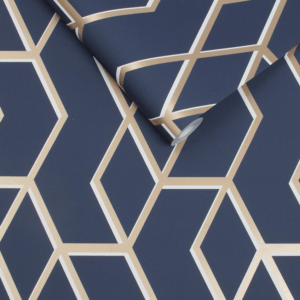 Try our Sapphire Velvet Plaza Stool and a strong geometric wallpaper. 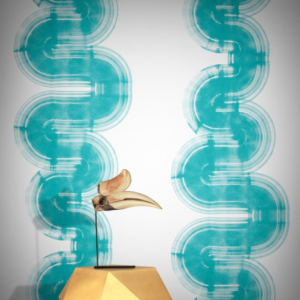 Keep a touch of brass within the wallpaper for that luxe feel. Finally, we come to the home office. If you have the luxury of a dedicated home office, you can afford to get a little more creative by designing an individual and unique scheme. However, if you have a compact workspace tucked away in a corner, these neutrals will sit well in any existing interiors. For this look, we are continuing with natural wood, but balancing the cool, scandi vibe with a rich Cashmere real leather. Balancing washed out woods with rich chocolate tones adds texture and keeps the overall look warmer. 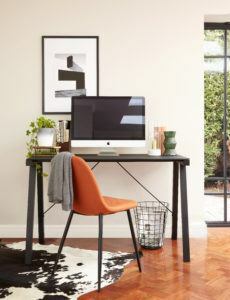 Warm neutrals are great for home office spaces as they promote concentration and productivity. Stylists Tip: Choose a playful wallpaper with subtle tones to keep the space interesting. Use different metallic finishes for a sleek, modern style. Balancing out warm neutrals with heather based colours will help to warm up and greys or earthy tones. 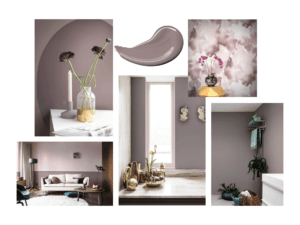 Dulux's Colour of the year 2018, Heartwood, is a perfect pairing to neutral shades as its earthy base helps pull out the lilac tones in your other furnishings. Find out more about Heartwood right here. By now, you should have a solid idea on how to use new, warming neutrals in your existing interiors. Remember, if you still want to use grey rather than natural colours, be sure to pick a warmer shade to keep your home cosy and on trend. If you decide to re-decorate or re-furnish your home with these tips in mind, be sure to tag us! Tag us by using #mydanetti on Facebook and Instagram to show off your Danetti Neutral Style! Buying that new piece of furniture is a very exciting time. Browsing through Pinterest and creating boards of your dream home is a great way to narrow down your search and define your style. But with so many styles and finishes out there, how do you whittle it down to that final piece? We are here to help. 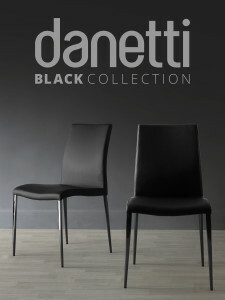 Two of our most popular furniture finishes here at Danetti are our high gloss and wood veneer furniture. 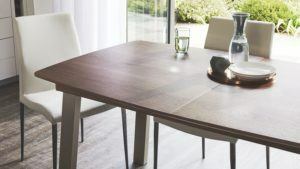 So we've written a few quick, easy to digest pointers on high gloss furniture and wood veneer furniture, to help you decide which is right for your home. High Gloss or Wood Veneer? Before you go head first into making your new furniture purchase, make sure you know what your new product will be used for. Families will need a harder wearing item, whereas first-time buyers can afford to choose a more delicate, stylish look. To make this easy, we're going to be looking at out Assi Range. 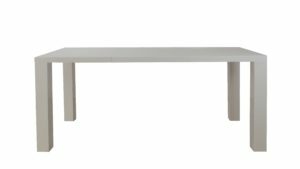 A collection on Extending Dining Tables and co-ordinating Sideboards available in White Gloss, White and Grey Gloss or Walnut Wood Veneer. We've teamed white high gloss with a variety of blue shades, a trendy palm print wallpaper and pops of copper. Inky tones are a huge interior design trend at the moment. However, when used sparingly with white gloss, you can create a stylish look without your home feeling too dark and moody. The copper highlight help brings a luxe touch, while the palm print adds personality. For tougher marks, warm soapy water and a clean dishcloth is all that's needed. Be sure to dry any water straight away with a clean, dry microfibre cloth. 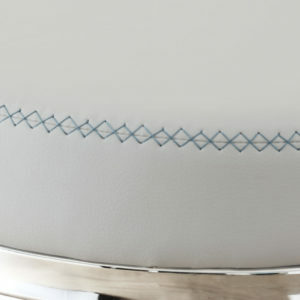 Use coasters and placemats- this will prevent any unsightly mug rings. Wipe up any spills quickly, as water left sitting on the surface may cause damage. The beauty of wood veneer furniture is that, without trying at all, you can bring colour and depth to any room. If you wanted to create a warming interior, we recommend keeping your base palette rich with walnut and dark greys. 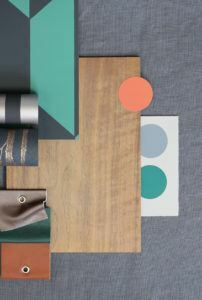 You can then play with pops of colour, such as an on-trend colour palette of green and terracotta. Adding a pop of colour will instantly lift any interior. 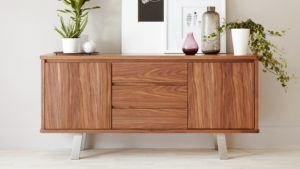 Wood Veneer furniture adds instant texture to a room, so you can afford to be experimental with softer finishes to create a well-balanced interior style. Stylists Top Tip: Replace terracotta with copper accessories and use green glass and props rather than painted walls. These items are cheaper and easy to update with the changing seasons. Meaning your home will always be bang on trend- without breaking the bank! So, now we've given you a quick rundown of high gloss vs wood veneer, you should now have more of an idea of how you'd furnish your home. 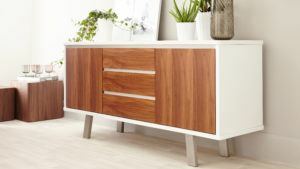 If you want more in-depth tips on caring for your final choice, check out our white gloss care guide, or our wood veneer post for tips and tricks catered to your chosen furniture finish. That said, it's not always a case of this or that. 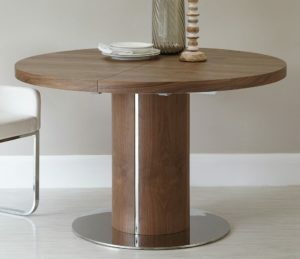 You can mix things up and style your home with both high gloss and wood veneer furniture! 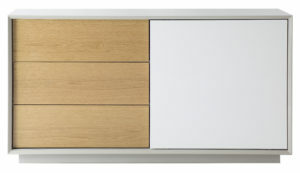 Our Assi Sideboard in White Gloss and Walnut is the perfect, versatile piece. 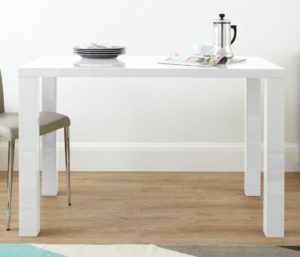 Pair it with any of our Assi Extending Dining Tables and you'll have a seamlessly pulled together, coordinated look. Still unsure? Let us know your questions in the comments below and we'll be happy to help! If you have decided on white gloss or walnut veneer, don't forget to share your pictures and tag us on Facebook and Instagram by using #mydanetti. 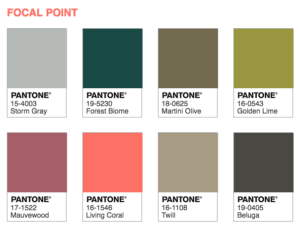 Every year Artists, Designers and Stylists all wait with baited breath for Pantone's Colour of the Year announcement. 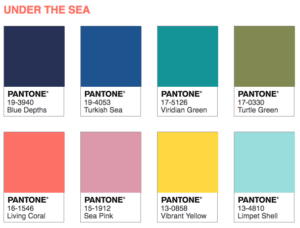 Last week Pantone refreshed our memory with previous winners of Colour of the Year, before releasing this year's colour. Welcome, Ultra Violet. In all honesty, we felt slightly underwhelmed with this seemingly primary colour. However, we very rarely see one colour used on its own. Once you begin to combine Ultra Violet with different colours, you start to see the life behind the colour. You see how it accents and plays off other tones, and how truly powerful the colour is. The internet is full of articles on the meaning behind Ultra Violet. Some point toward more political meanings, but we agree with the more creative and futuristic connotations. Think of Prince. Purple is his iconic colour trademark and is undoubtedly one of the most creative and talented individuals. Ever. The same goes for David Bowie and Jimi Hendrix, who all used Purple as a sign of the future, creativity, and equality. That said, it's unlikely anyone will be painting their entire house in Ultra Violet. Instead, we will use Ultra Violet in carefully selected harmonious colour pallets. 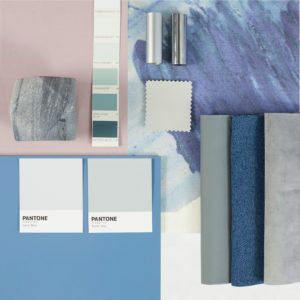 Pantone have created a range of suggested colour palettes all incorporating Ultra Violet to create different moods and looks. We're going to take a look at our 3 favourites, and show you how to work Ultra Violet into your home interior style. Ultra Violet is a vivid purple, so why not go all out and pair with deep, rich colours? 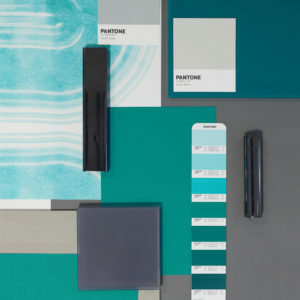 Pantone has created the Intrigue colour palette, featuring warm greys and harmonious blues. 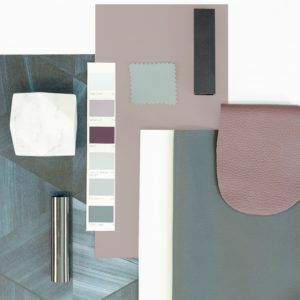 Despite being made up of cool colours, the undertones of the greys and blues used are warmer, which is key to this colour palette working for interiors. 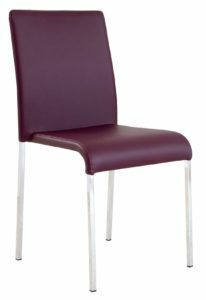 Our Riva Stackable Fabric Dining Chairs are perfect if you want to recreate this colour palette in your home. 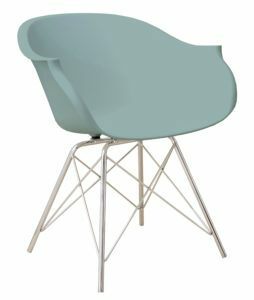 We all know colour trends come and go, so by updating just your dining chairs, you have a very cost-effective and quick home update. 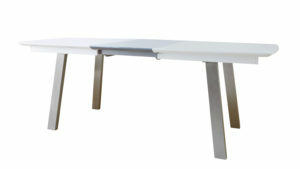 The Cross 4 seater dining table in Grey Gloss and Oak is ideal for the Intrigue colour palette. The Grey gloss table top helps to ground the bright and bold colours, whereas the wooden table leg adds a warm, homely touch. 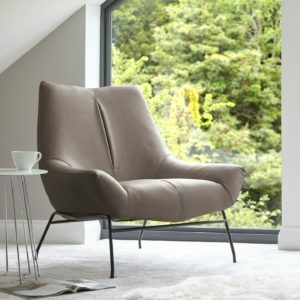 What's more, you can get this look for under £500! 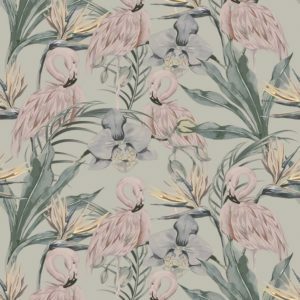 If you're feeling adventurous, play around with a bright wallpaper on a feature wall- we love Circus, by Cole and Sons. Unlike Intrigue, Kindred Spirit is a super harmonious colour combination as all the shades used sit closely together on the colour wheel. By teaming Ultra Violet with shades of purple, violet and pink we have created a completely different look. As much as this look would suit a little girls bedroom, it also works well in the everyday interior, you just need to know how to balance the sugary tones with base colours. Instead of using pink, add pops of metallic copper and substitute true lilacs for warm greys with lilac undertones. 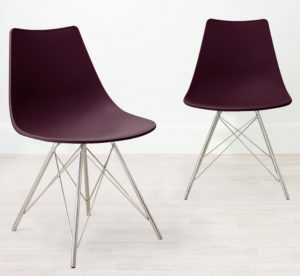 The Tori Dining Chair in Cool Grey and Mulberry Purple are great options for this colour scheme. The Mulberry purple brings the colour trend, while the cool grey stops your home feeling too sweet. Use monochrome and metallic accents to balance the colour and keep your interior crisp and modern. Pantone's Purple Haze colour palette sits in-between Intrigue and Kindred Spirits, with its cooler, more contemporary combination. 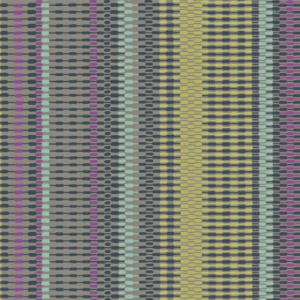 We see aqua and a dusky yellow teamed with more grey-based purples. Darker greys have been used to deepen the colour pallet and keep the look modern. This look is a great interior style for young families. The eclectic combination of the colour appeals to the young side, while the grey base notes add the style and contemporary feel. This look is super easy to create in your own home and works especially well with open plan living areas. 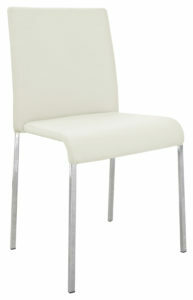 Start with a base of White, and introduce colour in your dining chairs and side tables and soft furnishings. Avoid your home feeling too cold by adding hints of brass throughout. How are you going to use Ultra Violet in your home? Balancing Ultra Violet with shades of grey will help ground your interior and avoid looking too sweet. 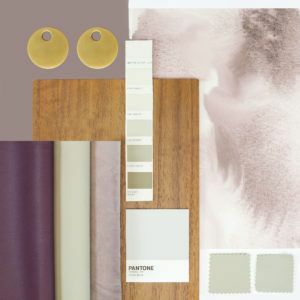 Using a taupe based grey will create a warmer colour palette. However, using a blue-based grey will create a cooler, more contemporary look. 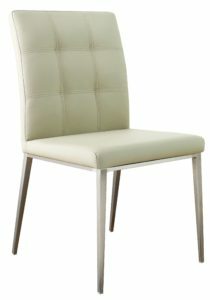 Don't be afraid to mix and match your dining chairs for a designer style. Choose opposite colours for a younger, more eclectic look. 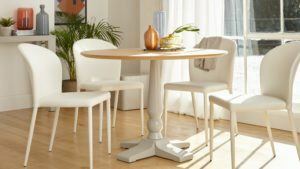 Keep your large furniture pieces, such as your dining table and sofa, more neutral. As these pieces are more expensive, it's not cost-effective to update these each season. Instead play around with the smaller pieces of furniture to add colour and style to your home. Metallics will help add warmth to a cool colour palette. 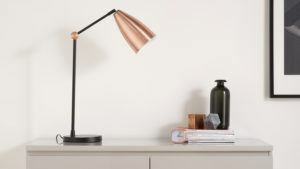 Brass and Copper are ideal for pulling out warmer tones in your greys and purples and will keep your home bang on trend. Remember to share your beautiful Danetti interiors with us on Facebook and Instagram by using #mydanetti in your shots. Have you used Ultra Violet in your home? Leave us a comment and let us know how you've styled it. The use of colour in our homes holds so much significance on how we feel and offers an insight into what is going on in our world. Knowing which colours are on trend is one thing, but selecting colours which are timeless takes much more thought. One of the greatest tools at our disposal is the influential aspects of fashion week, design week and the colour power house's colours of the year. 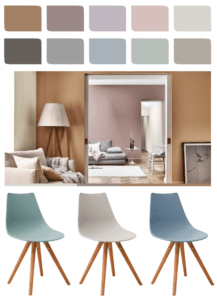 Last month Dulux announced their Colour of the Year for 2018... Welcome, Heartwood. Heartwood is "a beautiful warm neutral with a hint of heather", as described by Dulux. In these modern times, we all need a bit of nurturing, which is exactly where this dusky pink colour comes in. 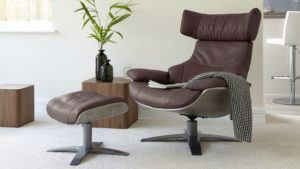 When used throughout the home we evoke feelings of warmth, calmness and nature. Think early, chilly mornings watching the sun creeping out from behind Britain's beautiful rolling fields. Having said that, we are well aware that not everyone has the same interior style, which is why we have created 4 different looks all using Heartwood. Showing you just how simple and versatile this colour really is. Who doesn't love monochrome interiors? 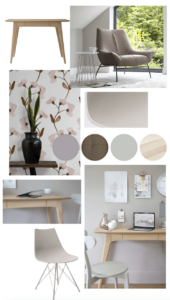 A simple greyscale colour palette suits any style, be it modern and contemporary or vintage-inspired interiors. The use of Heartwood in this colour board really softens the stark contrast between black, white and grey. Plus, by playing up the harmonious colours of heather and graphite grey, we manage to take a flat colour combination and turn it into a soft and serene look. To give this look a modern update, we've gone for a more contemporary finish, Black Chrome. This is the freshest in modern interiors and adds a real high end, designer feel to any home- without the designer price tag! You can check out our full range of Black Chrome products right here. Heartwood has subtle undertones of purple, meaning the other colours used in your home interiors can change the way this shade looks. The use of grey tones will result in a cooler Heartwood. However, balance with warmer neutrals and other shades of purple, and we pull out the true heather tones. 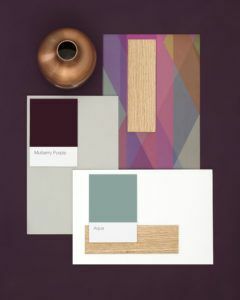 This mood board plays on this trick of the eye, by warming up with oatmeal and our favourite mulberry purple. 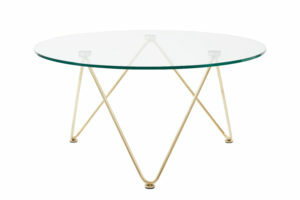 Work a hint of brass into your home accessories and you have a luxurious, opulent colour palette. However, be sure to keep your neutrals grounded with grey undertones. 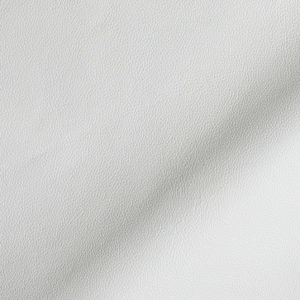 Cream tones can make Heartwood feel too sweet, which we don't want- grey tones will keep it mature and sophisticated. You can also create a real statement by using a bold wallpaper in a complementary colour, such as the one featured in our mood board, from Feathr. Baltic Seal Wallpaper from Feathr. When we think about the science behind the colour wheel, we know neighbouring colours sit well together as they create a harmonious feel. So what better colour combination for Heartwood than cool blues. 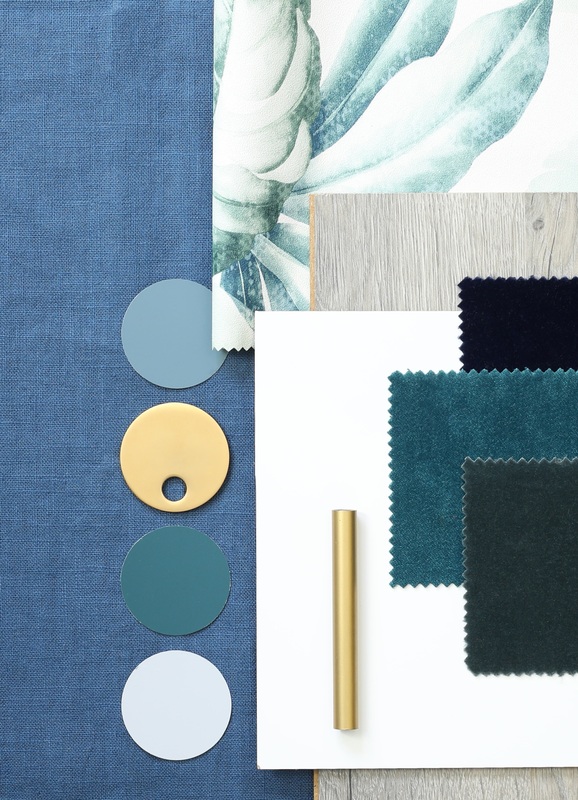 We've chosen a powder blue to avoid this look feeling too dark, however, if you are feeling brave, you can substitute lighter shades for navy and midnight blues for a real moody look. Balance out bold colours with different shades of grey, to keep your interiors modern. To avoid this colour combination feeling too young, play around with textures. 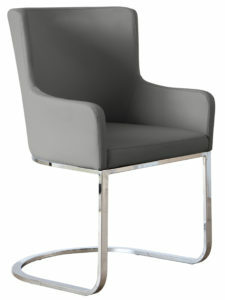 Mix brushed steel with chrome, and balance velvet with marble. It's these luxury details that will bring this look to life and give you a home to be proud of. We all know that colours trends come and go, with each season bringing new styles and accents colours. And sometimes we just don't have the time, funds, or willpower to paint our homes constantly. In which case, it's a good idea to keep your home neutral and play around with soft furnishings and textures. 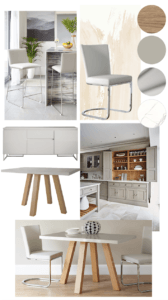 Our last mood board is a very subtle, classic and simple look. Keep your investment pieces (such as sofas, dining tables and flooring) neutral and timeless. Oak floors and tables along with grey walls are always a safe choice. Once your key pieces are in place, you can play around with quick, cost-effective seasonal updates. 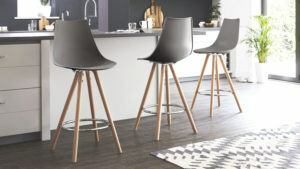 Side tables and stackable dining chairs are a great choice to refresh more regularly, as these tend to be slightly cheaper and can dramatically change the look and feel of a room. Stick to neutral colours in your investment pieces of furniture, and play around with your soft furnishings. Trends come and go! Choose colours with grey undertones to keep your interiors sophisticated and like the pages of your favourite interior magazines. This will stop Heartwood feeling too pretty and girly. 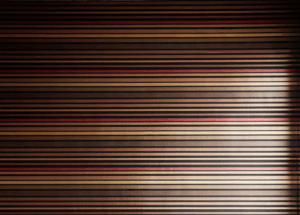 Play up textures in your interiors. Hard materials, such as marble, balanced with velvet, and brushed metals with a high gloss dining table. 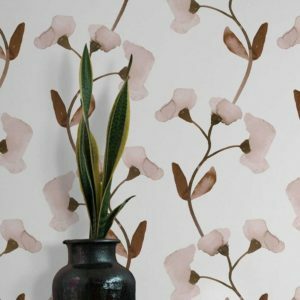 Choose a bold wallpaper in complementary colours to really show off your interior style. Brass accessories will warm up your dusky heather walls, where chrome or black chrome will keep it cool and super stylish. Like our suggestions? Why not share with us how you would use Heartwood in your home, and show us your pictures by using #mydanetti across Facebook, Instagram and Twitter! Previously we have explored the colour trend of using Oak & Blue together in our Dining Room (If you missed it, you can read all about it right here). This week we are going to mix things up a bit and look at a braver colour combination: Aqua and Mulberry Purple! 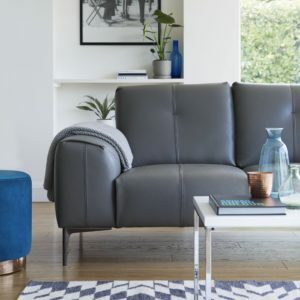 Over the last few years, we have witnessed the rise of dark colours in our homes, and this is one interior design trend that does not look like it's slowing anytime soon! Now is the time to update your look with rich, autumnal tones. We're talking deep mulberry purples and asphalt greys teamed with a refreshing aqua. Well, you don't want your home feeling too dark now the nights are drawing in! Let's start off with the ever popular Jewel Colours. Dominating the pages of your favourite Interior Magazine this is actually a really easy trend to pull off. You just need the confidence to do so! 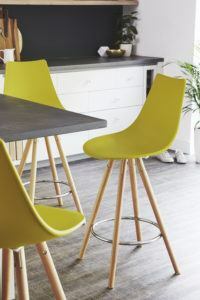 Coloured Dining Chairs are a great way to bring this trend to life as they add a punch of colour and attitude to any space, without creating huge house renovations. This room is subtle, white and very airy, but by dropping in a hint of Mulberry Purple we bring depth and mood to the space. 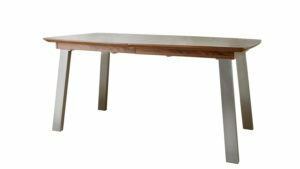 Our Fern Dining Table in Grey Gloss balances out the deep Purple tones, but also reflects the colour around the room. 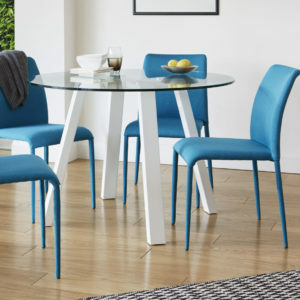 Instant colour coordination and a bang on trend dining area! Introduce Jewel tones like Sapphire and Emerald into your accessories to create a harmonious, colourful look. 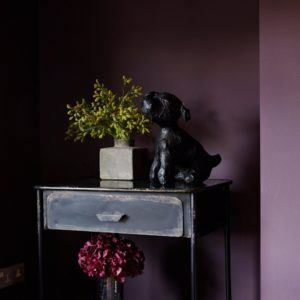 However, if you want a more dramatic dining room decorating trend, choose a Mulberry Colour Paint for your walls such as Abigail Ahern’s “Bleecker”. This is a very deep shade of purple which reflects light beautifully. Whether you paint just a feature wall or go all out and paint the walls, ceiling, skirting and door frames too, you will not be disappointed! Potentially the biggest Interior Design trend around is the light, airy and minimalist Scandi style. 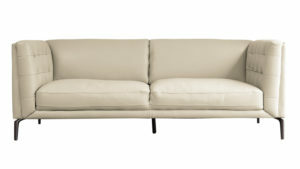 Typically this colour trend is a subtle palette of whites, neutrals and warm textures like chunky knits and naked woods. That's not to say it can't be colourful though! So, by reversing the volume of colour in this pallet and using just a hint of Mulberry Purple, we've create a very different look. 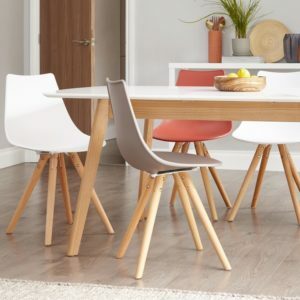 The wooden base of the Finn Dining Chair complements the Scandi look perfectly, while the Metro White Gloss Dining Table adds contrast and interest. By styling with coloured glass and sheepskin rugs, we were able to create a warm, inviting, coloured Scandi destination which is achievable in all existing Kitchens or Dining Rooms. 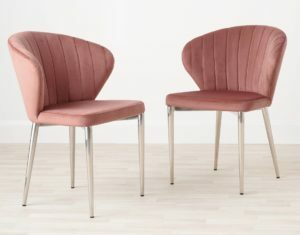 Share the colour across your Dining Chairs and Bar Stools for a perfectly coordinated style. 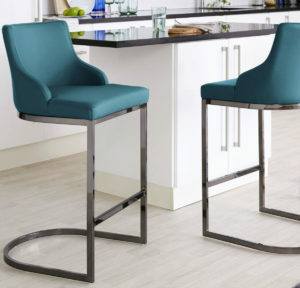 Take a look at this: by integrating the Stylo Dining Chair in Aqua, we were able to really lift the room and create a lighter and more refreshing colour scheme for a kitchen that's still in keeping with our Jewel Tone trend. The reason this colour combination works so well is that Aqua and Purple are opposite each other on the colour wheel. This makes them complementary colours. By deepening the Purple and lightening the Aqua this typically vivid colour combination becomes subtle, stylish, and oh so easy on the eye! 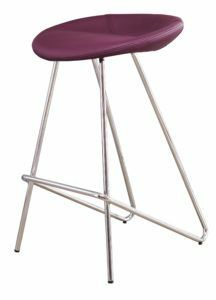 The Chrome Leg of our Stylo Dining Chair helps to keep the room modern, while the combination of Aqua, Purple and White keep it playful. 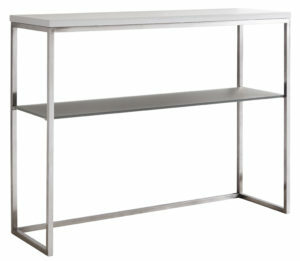 Keep accessories metallic and sleek for a modern contemporary dining room. For a Traditional Family Kitchen, try bright and bold accessories. 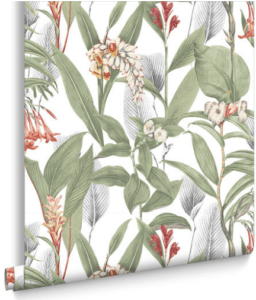 However, if you're feeling adventurous why not add in a colourful print or even a printed wallpaper? 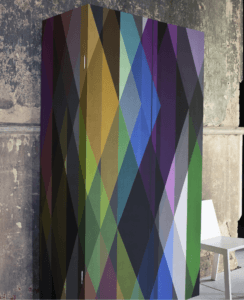 We can’t get enough of the Prism wallpaper by Cole & Sons. When picking colour combinations, try using a colour wheel. Aqua and Mulberry Purple are opposites on the colour wheel, making them complementary colours and a very visually stimulating combination. Want a more subtle colour combination? Choose colours which are neighbouring. These could be Aquas, Blues and Greens to create a very relaxing and tranquil setting. Play around with the volume of colour you use. Maybe stick to a darker colour on your walls and keep furniture and accessories light. Or opt for neutral walls and floors and keep your chairs and styling bold! 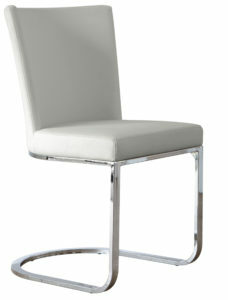 For a Modern look, use metallics, chrome and gloss finishes. For a scandi look, work with textures, neutrals and mix and match! 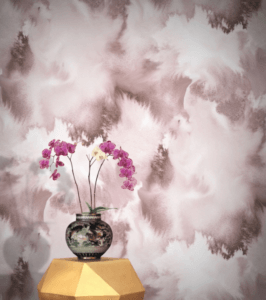 Adding a printed wall paper or dramatic colours to your walls will instantly change the look of a room. Rich, inky tones are very 'in' at the moment, so experiment with colours. Just remember to use tester pots on more than 1 wall. That way you can get a feel for the colour in different light and shade. What works opposite a window may look much different around the window itself! Stay tuned for the next 'How to use Colour in your Home". 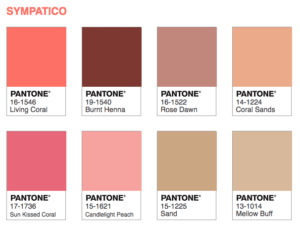 In the meantime, share with us the colours you have chosen on Twitter, Instagram and Facebook with #mydanetti!! 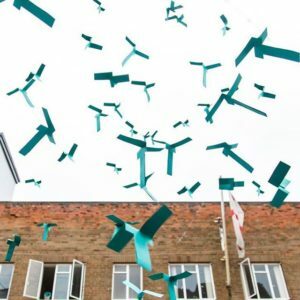 Marrs Green is a deep green with a hint of blue which creates an inviting Teal shade. It's warm, yet cool. Bright, although not overpowering. By introducing Marrs Green into your home, you’ll create a tranquil environment, with a strong design feel. We've been a fan of Marrs Green (or teal, in some form) for some time now, and have a couple of pieces you may be interested in. These quick and cost effective home updates can bring this courageous and harmonious colour into your home, without breaking the bank. 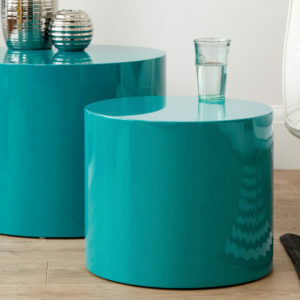 First of all, a Gloss Side Table is a great option for busy family homes. However, throw in a bold colour, such a Marrs Green, and you're onto a winner. 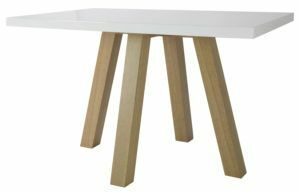 Stackable and nesting tables are a key furniture trend for 2017 as they're compact and stylish. 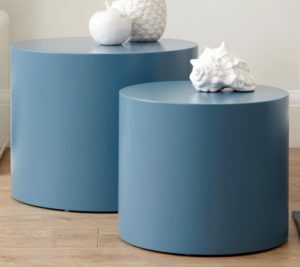 The Pebble Side Tables slide into any colourful home interior or minimal living space. 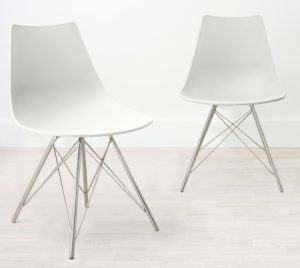 Plus, at just £199 for the set, they're the perfect, yet cost effective option for a quick home makeover. So, this is too bright for you? 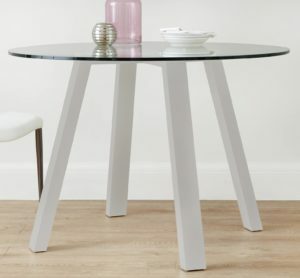 Maybe have a look at the Pebble white high gloss side table, and perhaps introduce Marrs Green in your accessories instead! 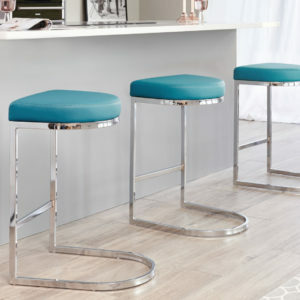 Injecting colour into your kitchen is probably the easiest way to update your home on a budget, but it doesn't get much easier than our Form barstools. 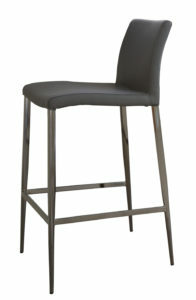 This is a great barstool for kitchen islands, especially as one of the key design elements is the contrasting stitch. 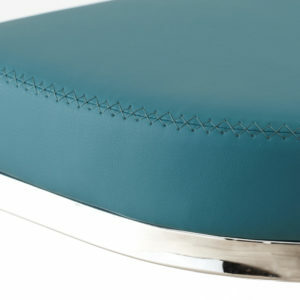 Whether you choose teal on teal, or a subtle white faux leather and teal stitching, either is a great way to introduce Marrs Green into your home. 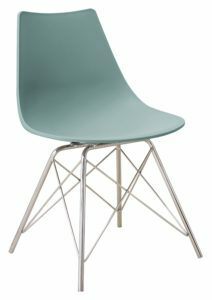 As you can see in our Marrs Green moodboard, black chrome works a treat to keep the Teal grounded with a more designer feel. 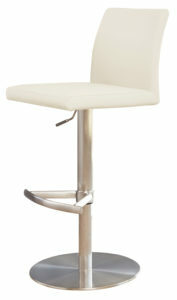 The Form Barstools also come with a black chrome base, and are also available with and without a backrest. 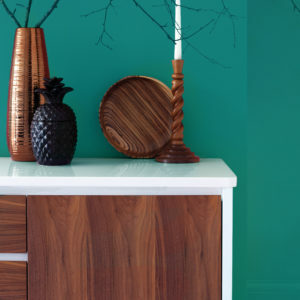 In addition to the Marrs Green furniture, why not look a creating a feature wall in this striking teal shade? You can find similar shades such as Farrow and Ball's Vardo and Little Greene's Canton, however we think Dulux have the closest colour, with their Proud Peacock. Team this colour with a beautiful printed wall paper (as seen in the aforementioned mood board) to nail 2017 colour trends. 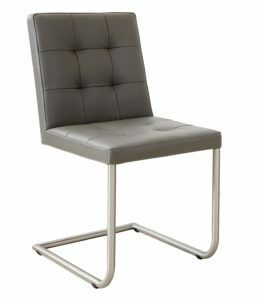 Or why not tone down with just the one accent wall, and let your new Danetti furniture do the talking! However, if you're feeling adventurous, give an ombre wall a bash! You can find out how to do this right here. Ok, so maybe the Teal Riva isn't quite the same shade as Marrs Green. We still wanted to share with you this delightful little space saver, and how to incorporate into this colour trend. 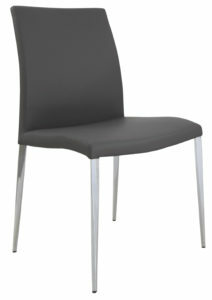 These affordable stackable dining chairs come in 7 different colours. 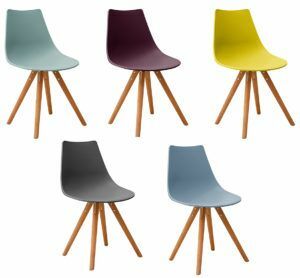 As a result, you can create your own colour combination and mix and match these dining chairs to suit whatever home style you love most. 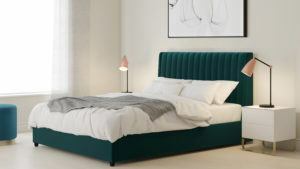 Are you a Marrs Green convert? Balance out the bright hue of Marrs Green with darker greys and bright whites. As a result, you'll have a cool and sleek home with a designer edge. You don't have to go bold. Introduce a subtle touch of Marrs Green within your soft furnishings, such as cushions, throws and rugs. While you're not going mad for the world's favourite colour in your home, you've clearly created a thought out and considered interior. Sometimes a bold print is enough. If, like us, you're a fan of White Gloss, Grey Leather and clean lines, create a juxtaposition with a softer, yet bold print. 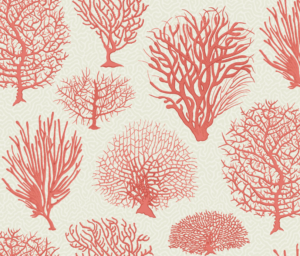 Whether in wallpaper or just within you wall art, it's a statement without being too dramatic. Now you know how to use Marrs Green in interiors, we'd love to see the results! Whether you've long since been a fan of teal, or are having a small home makeover, remember to use #mydanetti. Tag us in your pics on Facebook, Instagram and Twitter! Step aside, Greenery. There's a new favourite colour in town!